About Archives - BLIND FAITH LIVE ! Real People. Real Miracles.BLIND FAITH LIVE ! Real People. Real Miracles. from a recent speaking engagement. I have taken two of our most powerful miracle moments and put them on YouTube. They are incredibly emotional and exciting! Ann Henning, who was deformed by a freakish accident, and walked bent over at a 90° angle, is highlighted along with Lorene Riley. Lorene, a nurse, was given three months to live because her breastbone was collapsing inward and crushing her heart and lungs. These two women received instantaneous gifts from heaven. Please watch and let me know what you think. Mar 2, 2011 – Interview with Dr. Issam Nemeh. Dr. Oz – Is this Man a Faith Healer? January 31, 2011 – Meet the man who says he can heal the sick with his faith. Is he the real deal? You’ll hear from believers and skeptics. 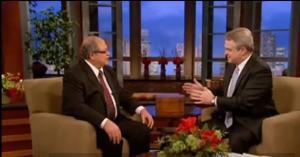 Dr. Oz has Dr. Issam Nemeh demonstrate his work on the show. See what happens. Aug 19, 2010 – Christian clergy members discuss the work of Issam Nemeh, M.D., specifically his healing services, their personal experiences with Dr. Nemeh, and their personal opinions about him.